There’s a lot you need to do as a couple as you prepare for your wedding. Finding the perfect wedding venue is one thing every engaged couple has on their wedding to-do list. However, it’s important to keep in mind that there’s more to a venue than just aesthetics. Naturally, you’re super excited about your upcoming special event, but don’t rush into signing any contracts until you are well informed of all the details. Below is a list of good questions to ask wedding venues in Northwest Indiana before you book. Grab a pen and paper and get ready to jot down some notes! Is the date available? It might not be. Is there a wait list? What surrounding dates are open? Venues often have different rates for different seasons, days of the week and times of day. Also, find out how far in advance you can reserve a date. How many hours are you paying for? How early can the setup crew, food, drinks and wedding party arrive, and how long after the wedding celebration can people stay? How many events does the venue host in one day? Some larger event venues host several different events on their property at the same time. This could mean hearing or even seeing other celebrations nearby or having to clear out quickly so another wedding can start. First, how much is the deposit? When do you pay the rest? Many venues require a deposit upon signing and confirming a date, and then you’ll pay in installments from the day you sign until your wedding date. What is their cancellation policy, and what happens if you need to make changes to your reservation? Is everything included in the total—service charges, cleaning fees, gratuity, etc.? Ask the planner to walk you through this. What’s the venue’s capacity? Be sure there’s plenty of room for your wedding party, guests, vendors and extras, like a dance floor, bar setup, photo booth and entertainment equipment. Does the venue offer amenities like wedding planners, a decorating team, food, bands and a sound system? If not, you’ll have to hire or rent your own. 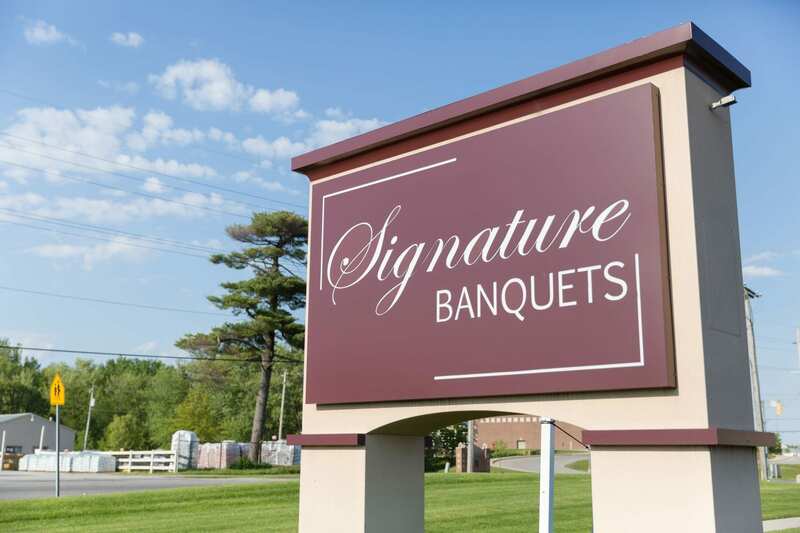 We hope you add Signature Banquets to your list of possible wedding venues in Northwest Indiana. Call us today for a free consultation and tour!